Carbon fiber and leather come together. Ralph Rodriguez is a Texas police officer with 15 years experience and an entrepreneur. Ten years ago, Rodriguez started Skull Crush and made his business applying Cerakote to firearms. 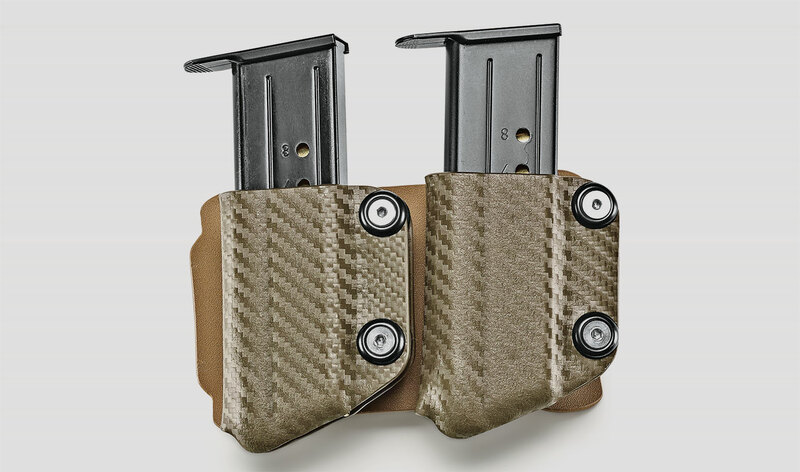 While carrying pistols of his own, he noticed that the Kydex was wearing down the finish, especially around the slide and the triggerguard where the retention point is designed on many Kydex holsters. To finish creating his new business venture, Rodriguez applied his talents in other ways. He constructed his own web­site and learned product photography. Though he is college educated, Rodriguez remembers learning most of what he needed through trial and error — and watching lots of YouTube videos. Skull Crush offers an inside-­the-­waistband (IWB) and outside-­the-­waistband (OWB) option for many pistols, even custom guns equipped with red dot sights and obscure or out-­of-­production models. They can do this level of customization through unique graphics programs that affords design flexibility and CNC cutting for precision. Enhancments to any holster only takes minutes in design. 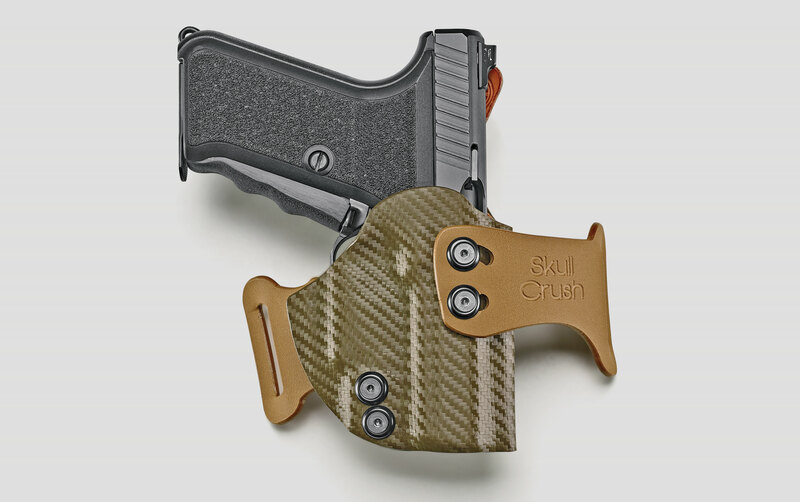 “Custom” also translates to “custom colors.” There are the standard black, olive drab and coyote brown options, but Skull Crush can also deliver holsters ranging from blood red to police blue, as well as several carbon-fiber colors. No, the carbon fiber isn’t a pattern; Skull Crush sells real, leather-­lined, carbon-­fiber holsters. Skull Crush also sells single, double and triple magazine pouches for single-­ and double-­stack mags. The pouch itself is also available in either Kydex or carbon-fiber materials, but the mount is a polymer. There are stainless-steel, Allen-­head screws that afford unique cant to each individual pouch. No carry rig is complete without a gun belt. Also made in Texas, the Skull Crush gun belt was designed to support the weight of a concealed or open-­carried pistol as well as a brace of spare magazines. It’s 11/2-­inches wide, which means that it’s compatible with most holsters and threads easily through most trouser’s belt loops. What is particularly unique to this belt is that it’s holes are spaced closely at 1/2-­inch apart. (Most belts feature holes spaced 1-­inch apart.) The advantage is that those of us who carry guns regularly can fine tune the tension of our belt with precision comfort. This wouldn’t be possible if this were a cheaply made single-­leather strap belt bought from a department store. If these were on a single-­layer belt, they’d be so close that the holes would wear and tear into a single large hole. Skull Crush’s belt is made of two contrasting pieces of leather featuring a sandwiched liner that starts behind the holes and continues around the remainder. It’s finished with a chrome-­plated roller buckle and is single-­stitched at the edges for good looks and security. To test the level of “custom” advertised by Skull Crush, I emailed Rodriguez through skullcrush.com and ordered an OWB holster for a classic HK P7M8. After selecting my colors and carry side, I asked for the carbon-­fiber option and added a double-­mag pouch (also made of carbon fiber) and a gun belt. It can take a month for Skull Crush to deliver, but the wait was worth it. Unlike a lot of the belts and holsters G&A tests, the Skull Crush OWB didn’t require a week’s worth of everyday carry to wear in. With tension adjusted, it was ready. 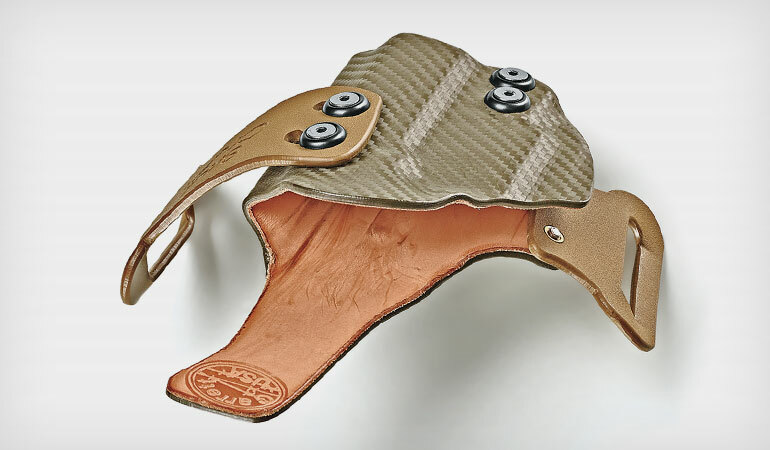 What was particularly interesting about the holster is that the leather changes the draw stroke experience. To me, it feels as though the pistol drags inside the holster as I draw, but it’s a smooth feeling and doesn’t appear to slow the timer. The holster is tension adjustable, which only affects how tightly the one-­piece shell clamps down on a pistol. The leather amplifies the gripping power of the tensioners. The most unique design feature is the belt mounts flex as you tighten your belt around your waist. This brought the pistol closer to my body and kept the top-­heavy, loaded-­magazine grip from pulling away from my waist. I wore this holster concealed under button-­down shirts that I test IWB holsters with and I didn’t suffer printing as with most OWB rigs. The only negative I experienced was with the stainless steel screws. I had two loosen with use that had to be reattached with blue Loctite. The best feature is that this holster affords a full firing grip. During this evaluation, I learned that the HK P7M8 uses magazines with a sharp protrusion at the front. This protrusion dragged and cut a groove on the inside at the front of the mag pouch with each draw. This drag interrupted reloads with spare magazines. If this were a different pistol such as any Glock, HK VP9 or SIG Sauer P320, this wouldn’t have occurred. If you’re considering a Skull Crush holster for an HK P7 as a result of this review, don’t buy a spare magazine pouch for it. Carry the mag in a pocket. I have no reservations in recommending the holster or gun belt. The belt is one of the best. Though currently a small business, Rodriguez’s taste for carbon fiber, kydex and leather are sure to make Skull Crush a success.